Having the right tools to eliminate a bed bug infestation is essential to your success. Our new bed bug kit includes the most advanced arsenal we have ever compiled encompassing all three professional classifications for effective treatments including Contacts, Residuals and Powder. Each product in our kit is designed to work in a specific area in order to accomplish the goal of treating harborage areas while at the same time establishing a residual defense for up to 12 weeks. Our exclusive kit is the latest on the market as it now includes the newest formulation of Bedlam ensuring you will not come across resistant strains of bed bugs. This kit contains enough product for 3 complete treatments. STERI-FAB has been used as an effective contact bed bug killer for many years and is popular for the fact that it evaporates within minutes leaving no residual behind. We like to use STERI-FAB to treat more sensitive areas like areas that come in contact with your skin, like mattresses, sofas cushions, chairs etc. Q: how safe for children and cats are the powders and sprays? The products included in this kit are generally safe for mammals such as children and cats. However, you should remove all pets and children from the area before you begin your treatment, and no one should come in contact with treated surfaces until those surfaces are fully dry. Q: Are the products in your professional bed bug kit child safe? After using these products, do I have to keep my kids out of the room for a while? Generally speaking, all of our products are safe for children and pets when applied according to the instructions on the labels. You'll want to remove other people and pets from the room while you're spraying, and wait for the treated surfaces to dry before letting anyone come in contact with them. The kit is not just a bunch of sprays. Each spray has does something different, which is why it works. We called first and learned how to use the kit. They were helpful and were concerned about making sure we did it right. Reviewed by: Tina from Cameron Park, CA. I have tried many products trying to get rid of these awful bedbugs and nothing worked...UNTIL.... 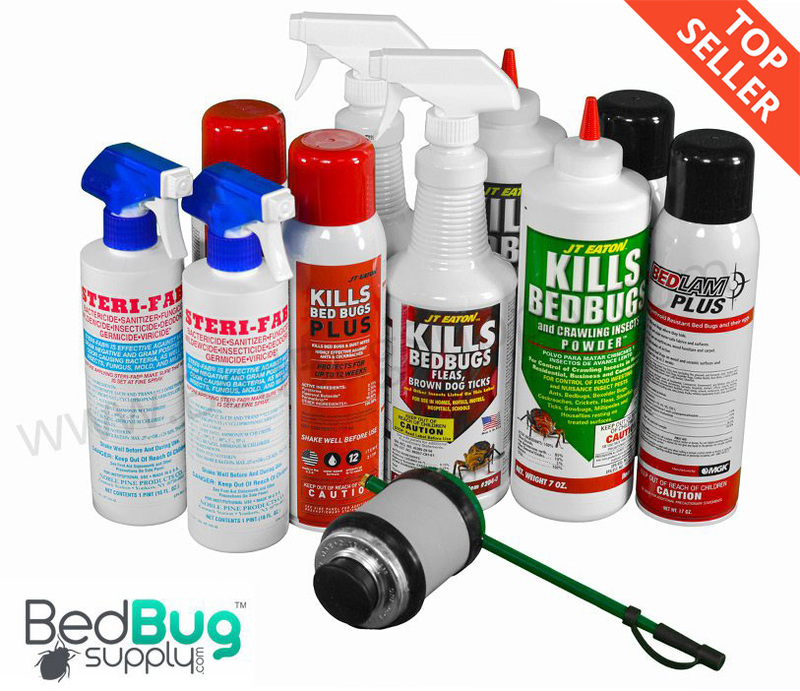 I tried BedBug Supply and their products! Between the excellent and extremely helpful videos and products that actually work I can now say that I am getting this problem under control at last!!! The products worked fast and the population seems to have diaappeared almost completely...and I'm sure that they will be eradicated before too long. I am also keeping these products on hand for maintenance. Thank you BedBug Supply company!! I would recommend this company and these products. Reviewed by: Ro from Los Angeles, CA. Reviewed by: michael from Bakersfield ca. We used some of the products and was pleased so far. We had not seen any bed bugs in over a month, but after using the steamer and the products we saw several climbing up the walls, coming out of hiding and they died soon afterward. so far so good. We will see in a few weeks. Reviewed by: Lynda Larkin from Boca Raton, Fl. My wife and kids were being bit, but I wasn't. So we had no reason to believe we had Bed Bugs until we actually found one. ONE, is enough to take Action. Their is more. After a quote from 2 different Bug Kill Companies varying from $1,100- $2,000, which we couldn't afford, we took to the web. I found BBS (Bed Bug Supply), and Thank God. We ordered Box Spring and Mattress Encasements for All Rooms, and the "Killer" Kit. It is recommended for up to 3-4 rooms. This is a Great Kit. Watch the videos supplied by BBS and follow to the best of your ability. I didn't have a steamer and couldn't afford to buy one, so we tried without that step. Keep in mind we had only found 1 Bug. We had success with the 3-4 room Kit and Encasements. My Family is Bite and Bug Free now!!!! WOOHOO. OH, Shipping was recieved in 2 days and was as discreet as it could be. I have nothing bad to say at All about BBS. Awesome! Reviewed by: Matthew from Tennessee. We didn't have a big problem with bedbugs. I think we got them before they got out of hand. But the kit we ordered helped very much. We used the kit the day we got it and everything worked great. As far as I can tell we are free of the pest. I hope. Reviewed by: James from Pa.. I love these product. We followed the steps and so far it has seemed to work wonderfully. Reviewed by: Severiana Casiano from Newark, NJ. My Wife purchase a comforter from Overstock.com and it was infested with bed bugs, we were not aware of it till we started finding blood spots on our sheets, I have a regular pest control person, he came out and spray everything in our room twice and it did not get rid of the bed bugs. I found beg bug supply from google and we follow the four steps on their video and we wash all our clothes and spray the inside and out on our dressers. Today has been one week since our process and I have found only one bug so far on the floor which was dead. The instruction on the video states you should reapply the chemicals twice every two weeks but I'll reapply it once a week for the next 4 weeks just to be safe. I'm 100% satisfy with these products so far. We have not been bitten once since we follow the instruction video. we also purchase the interceptors and the mattress and box spring encasements. Bill C.
Reviewed by: Bill from Bakersfield, Ca.. Reviewed by: Jeffrey Farage from . Reviewed by: Erika from Reseda.